The T1 E1 J1 Switch can be used to control multiple T1/E1 lines to monitor, drop and insert, and perform intrusive and non-intrusive tests simultaneously. One can operate the switch in different modes by just changing relay settings remotely without requiring any changes to the physical connection. 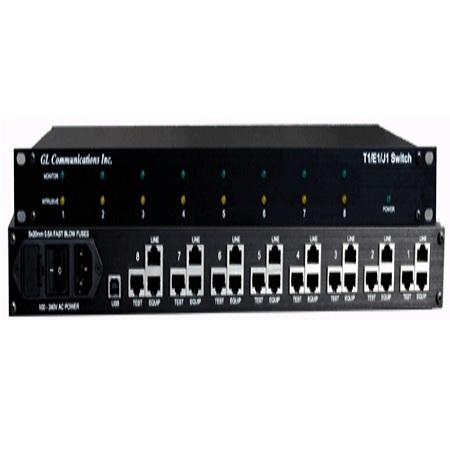 The T1/E1/J1 switch device is designed to monitor and intrusively test up to eight individual T1/E1/J1 lines. The switch can be remotely controlled via a USB connection. Both GUI as well as CLI control are available for controlling the switch in various modes for monitoring and diagnostic purposes. One Rj-48c monitor connector for monitoring both directions of a full duplex high-speed line. Up to 8 full duplex T1, E1, and J1 lines can be supported per unit.